If landscape design is an art form, then our pavers are truly accomplished artists in their own right. For the most creative, reliable landscaping service in New Zealand, Capital Paving is your first choice. Whether you require the installation of sturdy, yet aesthetically pleasing public pavement, or paving work around your home, we have got you covered. Our experienced team of pavers and landscaping experts pride themselves on offering you a broad range of services. Driveways, grass paving, patio design and brick pavement are just a few of the areas we specialise in. Using only the highest quality, durable stone tiles, we have designed and built all manner of landscape design projects across the wider Wellington region. The most telling endorsement of our work is the glowing feedback we regularly receive from satisfied clients. Our services come without risk, as we guarantee a high standard of workmanship, while adhering to all applicable health and safety standards. 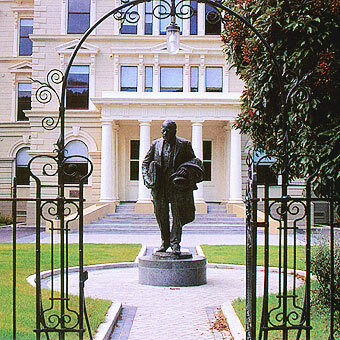 Government Buildings, Wellington: Capital Paving Limited was selected to lay Firth Holland Pavers around the refurbished precinct to add an old world charm.